We're happy to announce Link to MIDI Bridge for Android, a new app that lets you synchronize hardware MIDI devices (synths, drum machines, etc.) that support MIDI Clock with an Ableton Link Session. The BETA tests started today. If you're willing to join the tests, just visit the G-Stomper Public BETA Group on google+ and click "ask to join". Once you have joined the group, follow the instructions in the Link to MIDI Bridge 1.0 BETA post. To join the BETA tests, you need a Google account, a Google+ profile, and the Google Play Store must be installed on your device. This is the case on most devices, but not on Amazon Kindle Fire for example. What is Link to MIDI Bridge? 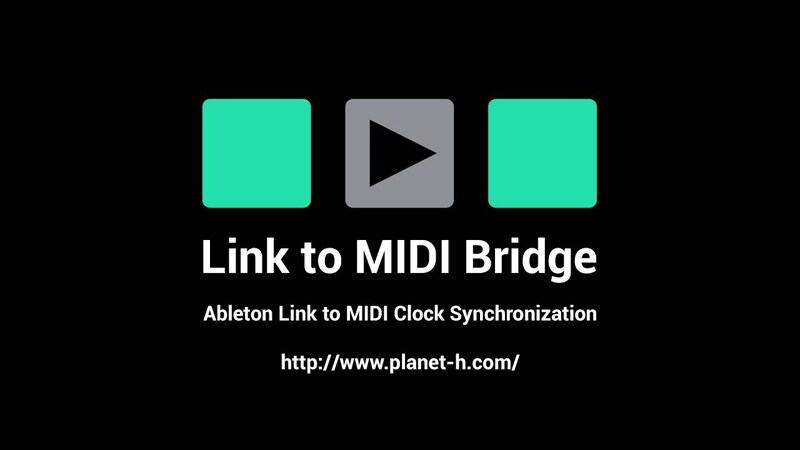 Link to MIDI Bridge is "Ableton Link to MIDI-Clock Synchronization"
Link to MIDI Bridge creates a virtual bridge between your Ableton Link Session and musical devices that support MIDI Clock Synchronization. Link to MIDI Bridge is recommended for use with hardware MIDI devices, hooked up either directly over USB MIDI or in use of a USB MIDI to DIN interface. It is technically possible to synchronize other apps over MIDI clock, but it’s not recommended because of timing inaccuracies. Also, MIDI over Bluetooth LE is technically possible, but it’s not recommended because of timing inaccuracies in the BLE transmission. Early BETA testers can grab it for free until 22nd of August 2017. Hope Android gets more as a Music Making Device with this nice app. Cris_ wrote: YEAH! I'am in.. Connected via USB-2-Midi Cable from my external DAC to OTG Adapter. and all devices connected via Ableton Link also! Tested Apps: Beatonal, G-Stomper Rhythm, NinjaJamm, Reactable, Remixlive and SevenPad. Feature Request: Midi Clock In 2 Ableton Link. Most DAWs on PC except Ableton as no Ableton Link support but Midi Clock Out. The reason for me for your App. Can i speak German? then i can better tell what i mean-/think. Thanks a lot for the test report, Chris_. May I ask what sort of USB to MIDI adapter you've used? brand, model? Also interesting would be to know, what android device models you've used. What exactly do you mean with "almost" stable? Or in other words, how unstable is almost stable? And on what device did you measure it? I drove tests with hardware gears (Electribe SX + Deluge), which both received an ultra stable MIDI clock. I've let them run in sync for around 15 minutes, and there was not a single millisecond of a drift off. But that's surely depending on various factors. Usually, software of any kind is not able to receive a MIDI clock in a really stable way. That's why many DAWs not support MIDI clock IN. Hardware gears behaves different, as these often have dedicated components just stable MIDI IN handling. Cris_ wrote: Feature Request: Midi Clock In 2 Ableton Link. Unfortunately I cannot do that, for two main reasons. Ableton Link is not supposed to have a master in the session. And by syncing one of the link peers (in this case the Link to MIDI bridge) over MIDI clock from outside, then this peer will influence the tempo of all other peers at every time, in other words, it would become the master. If one link peer gets synced from outside using MIDI clock, it would still be synced from the Link session, which would mean both sync mechanisms would fight each other. Imagine what would happen if some other peer changes the tempo... What would happen on the peer that is synced from outside using MIDI clock? We recommend making Link mutually exclusive with other sync technologies that may be supported by your app, such as MIDI Clock or WIST. Having two concurrent clock sources fighting each other will degrade the Link session and compromise the user experience. The ABLLinkSetIsEnabledCallback callback registration function can be used to observe when Link has been enabled by the user in order to disable UI elements and functionality of other sync technologies. Receiving the MIDI clock in a stable way is way more difficult to achieve than sending a stable MIDI clock out. I drove various tests, and yes, on some devices, it's possible to receive a stable clock, but by far not on all. And I don't want this new app end in a poor user experience. Cris_ wrote: Can i speak German? then i can better tell what i mean-/think. If you contact me by mail (I've just sent you a mail, so you got my address), then yes. I'm located in Switzerland, so German is fine. In the forum, I would prefer to stick with English, since otherwise most others won't understand it anymore.